by Antonietta Chiodo, ProMosaik, English translation by Milena Rampoldi, ProMosaik. A couple of days ago, the leader of al Fatah, Marwan Barghouti, published his shocking article on New York Times. He had just started a legendary protest, called the “struggle of the empty stomachs”. Marwan has been able to start an extended nonviolent struggle of at least 1,300 prisoners in Israeli prisons, a hunger strike. The objective is to show their reality to the rest of the world and to make people understand what is going on in this land of denied rights. In his article published by the New York Times, Marwan attacks Israeli military forces using very hard words. The Zionist regime is responsible for the total absence and/or the daily violation of human rights, for daily physical and psychological torture, and also for bad food. In these hours, the population wants the competent authorities to take their responsibility to sanction a state whose law is based on the exercise of violence and power against a helpless population. However, as we can see today, this population has not stopped resisting. The President of the Palestinian Authority Abu Mazen declared his unconditioned solidarity with the Palestinian prisoners. The groups next to Hamas and the Islamic Party have not made a clear decision about whether they will participate in the hunger strike by involving their own members in Israeli prisons or not. 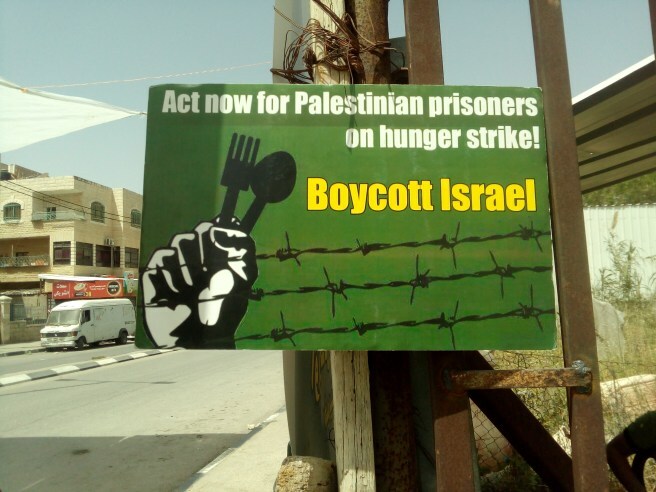 The day after the publication of Barghouti’s article and the extended participation in the hunger strike by prisoners, the Knesset put the leader Marwan Barghouti and three other main organizers of the protest into solitary confinement in the high-security prison in the Northern West Bank next to the city of Jenin. Since the beginning of the protests, the clashes and arrests are increasing, in particular around Nablus, Hebron, and Bethlehem. Today I went into the streets and talked to a group of people during a solidarity rally for the Palestinian prisoners on hunger strike. Among them there was an handicapped child about eight years old. Some of them wore gas masks. An ambulance was ready to intervene in case of clashes. Everywhere the shapes of Israeli soldiers. In sight of the separation wall. There were up-turned garbage containers which make me think about a day full of tensions. During the rally, I talked to Khaled, one of the guys participating in the protests, to ask him a couple of questions about them. Has there been news from the prisons during these last hours? I cannot answer this question… I cannot say anything about it… I am just a man who decided to take to the streets these days… as many women and children did… We would like to tell the world what has been happening in this land for seventy years now…. However, politics are the heart of Palestine… The whole world turns around politics. We do not want to know if one is on our part or not… since this is our life, and our freedom, and we will continue our resistance against the occupation, day after day… If you want to know if we trust Abu Mazen, then I can answer you: No, Palestine has stopped trusting him since a long time now. We protest the whole day, also in the evening. They usually attack us in the afternoon or after sunset. As you can see, we have no arms. We just have flags but we resist. Because resisting is the thing we can do best. And it is not a coincidence that the majority of people participating in these rallies come from the refugee camps, in particular from the Dheisheh Refugee Camp. Yes, I am absolutely convinced that it is a light, an open window so that the world can look in here. So that everyone can see how strong we, the Palestinians, are. We prefer dying than continuing to be oppressed and tortured. Our situation has been unchanged for seventy years now. So our fellows have started this struggle, and we have to support them because they are brave men and true examples for us.